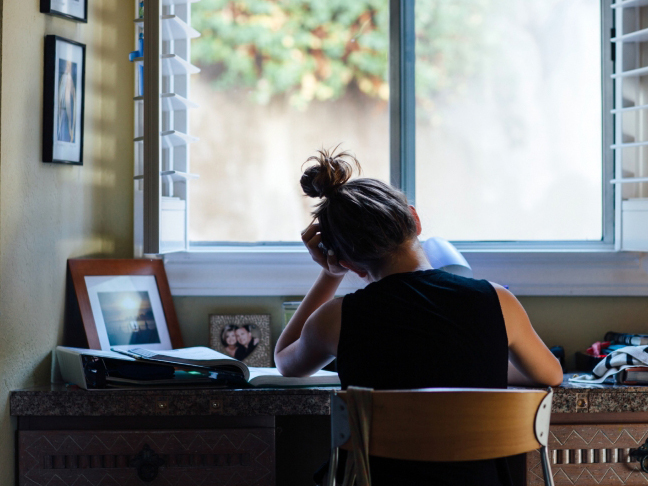 Anxious Kids, Anxious Parents offers concrete strategies to support all students who experience anxiety at any level. The Gray Public Library has an adult summer reading opportunity. Interesting in signing up or learning more? Please stop by the front desk! Summer Adult Reading Opportunity at the Gray Public Library! Anxious Kids, Anxious Parents offers concrete strategies to support all students who experience anxiety at any level. Interesting in signing up or learning more? Please stop by the front desk! Anxiety tends to be repetitive. Help your child build “Reminder Bridges” before anxiety shows up. Example – if your child always gets anxious before a test but ends up doing okay, remind them that this a pattern. Ask them what happened the last time worry showed up this way, help them see they were uncomfortable, uncertain, but they moved through it. This “Reminder Bridge” is their tool for the next time worry shows up this way. Connecting to these past successes through Reminder Bridges lays the groundwork for new neural pathways and through repetition defeats worry. Check out this article from Lynn Lyons, LICSW! Successful Community Presentation and Workshop! 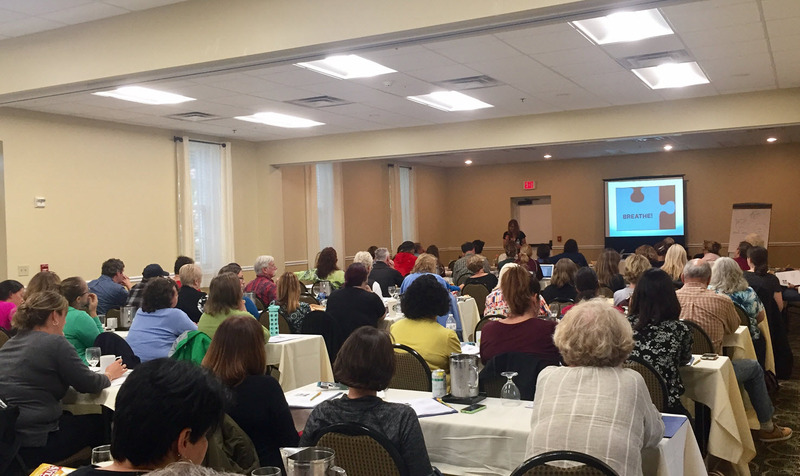 Thank you to Lynn Lyons who visited Maine and provided one community presentation and one training for our service area! Lynn is an internationally recognized expert in the field of anxiety. To learn more about Lynn, visit her website here. 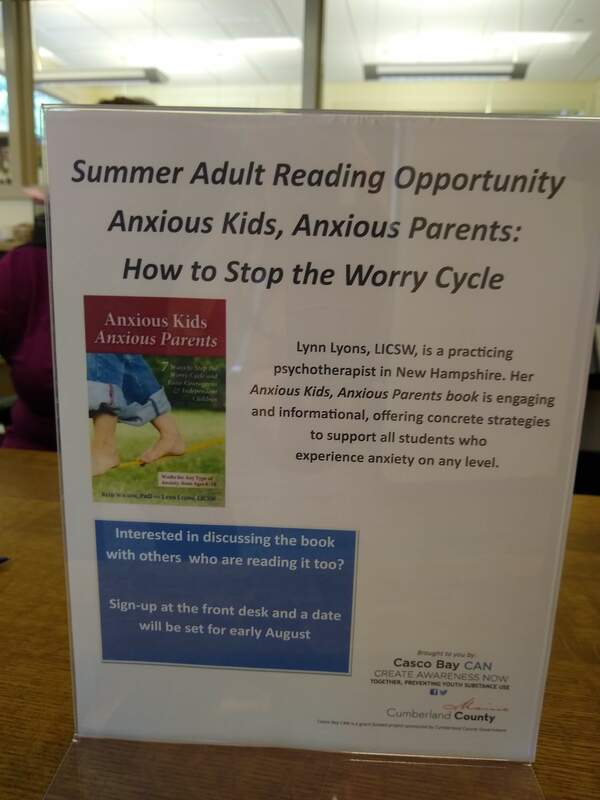 In preparation for our Lynn Lyons, Anxious Kids, Anxious Parents, event coming up next Monday, September 18th, we will be posting a series of articles from the Partnership for Drug-Free Kids. 1. Act as a cheerleader and supporter for your teen – provide the necessary supplies and show an active interest in the content your child is learning, but allow the teachers to handle it if your kid fails to do the homework correctly or regularly. 2. Recognize that children learn in different ways and have different work styles – some do homework all at once, while others need to take frequent breaks. Discuss with your child the working conditions that will lead to the best homework outcomes. 3. Work WITH your child to develop a schedule that will allow time to complete homework, work on projects and study for tests – while still attending activities, getting adequate sleep and having time for play. 4. Don’t underestimate the importance of non-academic achievements. Challenge Success emphasizes that kids – regardless of age — need playtime, downtime and family time (‘PDF’) each day. Research show this acts as a protective factor for long-term academic engagement and overall well-being. 5. Allow space and rejuvenation between activities. Encourage teens to unwind by listening to music, reading for pleasure and spending time with friends. Kids need time to reflect and dream, explore the world, develop interests, make friends and craft an identity. 6. Schedule high-quality family time multiple times a week to give kids the experience of unconditional love, acceptance and support. Eat meals together, take walks, swap stories and practice family traditions. 7. As a family, discuss the characteristics of success that you value most (e.g., compassion, integrity, health). Remind your kids that success is measured over the course of a lifetime, not at the end of a semester. 8. Explain that there are many different paths to success. Talk about your own path, including your struggles and failures. 10. Help your teen find the right-fit college or post-secondary opportunity. Debunk the myth that only the most prestigious colleges will lead to success. Support your teens by giving them the skills to help plan their time better. Foster a healthy definition of “success.” Make sure your children know that they are loved for who they are, not only for how well they perform. Talk to them about the dangers of stimulant abuse. 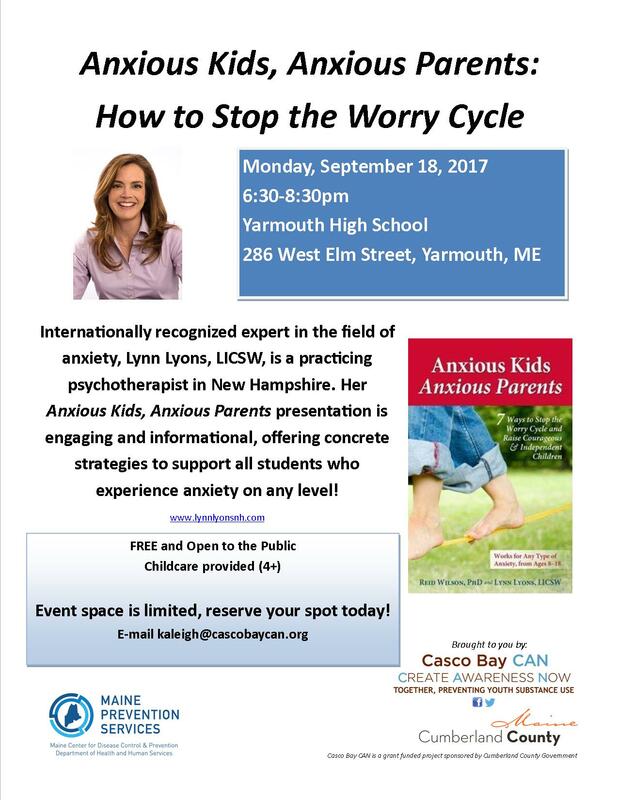 Anxious Kids, Anxious Parents Event! 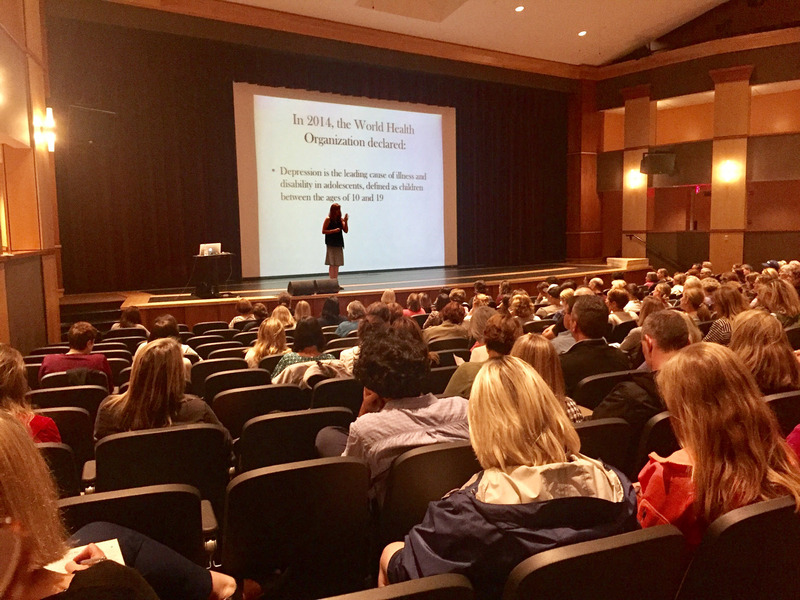 Due to high popularity we have moved the Lynn Lyons presentation from the Frank Harrison Middle School to the Yarmouth Performing Arts Center at Yarmouth High School. The address is 286 West Elm Street in Yarmouth.